The following prescribing information is based on official labeling in effect July 2005. Pamidronate disodium is a white-to-practically-white powder. It is soluble in water and in 2N sodium hydroxide, sparingly soluble in 0.1N hydrochloric acid and in 0.1N acetic acid, and practically insoluble in organic solvents. Its molecular formula is C 3 H 9 NO 7 P 2 Na 2 ·5H 2 O and its molecular weight is 369.1. The pharmacokinetics of pamidronate were studied in cancer patients (n=19) with normal and varying degrees of renal impairment. Each patient received a single 90-mg dose of Aredia infused over 4 hours. 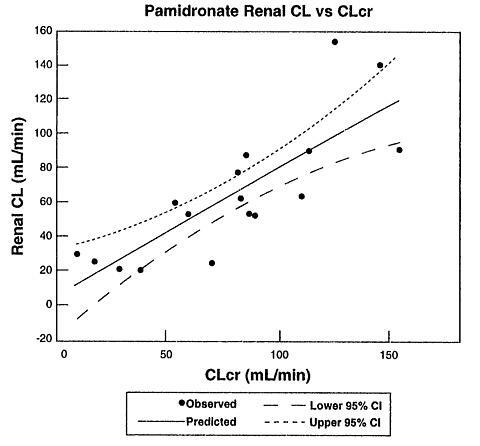 The renal clearance of pamidronate in patients was found to closely correlate with creatinine clearance (see Figure 1) . A trend toward a lower percentage of drug excreted unchanged in urine was observed in renally impaired patients. Adverse experiences noted were not found to be related to changes in renal clearance of pamidronate. Given the recommended dose, 90 mg infused over 4 hours, excessive accumulation of pamidronate in renally impaired patients is not anticipated if Aredia is administered on a monthly basis. prediction line and 95% confidence intervals. The pharmacokinetics of pamidronate were studied in male cancer patients at risk for bone metastases with normal hepatic function (n=6) and mild to moderate hepatic dysfunction (n=7). Each patient received a single 90-mg dose of Aredia infused over 4 hours. Although there was a statistically significant difference in the pharmacokinetics between patients with normal and impaired hepatic function, the difference was not considered clinically relevant. Patients with hepatic impairment exhibited higher mean AUC (53%) and C max (29%), and decreased plasma clearance (33%) values. Nevertheless, pamidronate was still rapidly cleared from the plasma. Drug levels were not detectable in patients by 12 to 36 hours after drug infusion. Because Aredia is administered on a monthly basis, drug accumulation is not expected. No changes in Aredia dosing regimen are recommended for patients with mild to moderate abnormal hepatic function. Aredia has not been studied in patients with severe hepatic impairment. Total serum calcium levels in patients who have hypercalcemia of malignancy may not reflect the severity of hypercalcemia, since concomitant hypoalbuminemia is commonly present. Ideally, ionized calcium levels should be used to diagnose and follow hypercalcemic conditions; however, these are not commonly or rapidly available in many clinical situations. Therefore, adjustment of the total serum calcium value for differences in albumin levels is often used in place of measurement of ionized calcium; several nomograms are in use for this type of calculation (see DOSAGE AND ADMINISTRATION ). In one double-blind clinical trial, 52 patients who had hypercalcemia of malignancy were enrolled to receive 30 mg, 60 mg, or 90 mg of Aredia as a single 24-hour intravenous infusion if their corrected serum calcium levels were >/=12.0 mg/dL after 48 hours of saline hydration. The majority of patients (64%) had decreases in albumin-corrected serum calcium levels by 24 hours after initiation of treatment. Mean-corrected serum calcium levels at days 2-7 after initiation of treatment with Aredia were significantly reduced from baseline in all three dosage groups. As a result, by 7 days after initiation of treatment with Aredia, 40%, 61%, and 100% of the patients receiving 30 mg, 60 mg, and 90 mg of Aredia, respectively, had normal-corrected serum calcium levels. Many patients (33%-53%) in the 60-mg and 90-mg dosage groups continued to have normal-corrected serum calcium levels, or a partial response (>/=15% decrease of corrected serum calcium from baseline), at Day 14. In a second double-blind, controlled clinical trial, 65 cancer patients who had corrected serum calcium levels of >/=12.0 mg/dL after at least 24 hours of saline hydration were randomized to receive either 60 mg of Aredia as a single 24-hour intravenous infusion or 7.5 mg/kg of etidronate disodium as a 2-hour intravenous infusion daily for 3 days. Thirty patients were randomized to receive Aredia and 35 to receive etidronate disodium. By Day 7, 70% of the patients in the Aredia group and 41% of the patients in the etidronate disodium group had normal-corrected serum calcium levels (P<0.05). When partial responders (>/=15% decrease of serum calcium from baseline) were also included, the response rates were 97% for the Aredia group and 65% for the etidronate disodium group (P<0.01). Mean-corrected serum calcium for the Aredia and etidronate disodium groups decreased from baseline values to 10.4 and 11.2 mg/dL, respectively, on Day 7. At Day 14, 43% of patients in the Aredia group and 18% of patients in the etidronate disodium group still had normal-corrected serum calcium levels, or maintenance of a partial response. For responders in the Aredia and etidronate disodium groups, the median duration of response was similar (7 and 5 days, respectively). The time course of effect on corrected serum calcium is summarized in the following table. In a third multicenter, randomized, parallel double-blind trial, a group of 69 cancer patients with hypercalcemia was enrolled to receive 60 mg of Aredia as a 4- or 24-hour infusion, which was compared to a saline treatment group. Patients who had a corrected serum calcium level of >/=12.0 mg/dL after 24 hours of saline hydration were eligible for this trial. In a fourth multicenter, randomized, double-blind trial, 103 patients with cancer and hypercalcemia (corrected serum calcium >/=12.0 mg/dL) received 90 mg of Aredia as a 2-hour infusion. The mean baseline corrected serum calcium was 14.0 mg/dL. Patients were not required to receive IV hydration prior to drug administration, but all subjects did receive at least 500 mL of IV saline hydration concomitantly with the pamidronate infusion. By Day 10 after drug infusion, 70% of patients had normal corrected serum calcium levels (<10.8 mg/dL). The median maximum percent decreases from baseline in serum alkaline phosphatase and urine hydroxyproline/creatinine ratios were 25%, 41%, and 57%, and 25%, 47%, and 61% for the 15-mg, 45-mg, and 90-mg groups, respectively. The median time to response (>/=50% decrease) for serum alkaline phosphatase was approximately 1 month for the 90-mg group, and the response duration ranged from 1 to 372 days. Twenty-five patients who had Paget's disease were retreated with 90 mg of Aredia. Of these, 44% had a >/=50% decrease in serum alkaline phosphatase from baseline after treatment, and 39% had a >/=50% decrease in urine hydroxyproline/creatinine ratio from baseline after treatment. After 21 months, the proportion of patients experiencing any skeletal event remained significantly smaller in the Aredia group than the placebo group (P=.015). In addition, the mean skeletal morbidity rate (#SRE/year) was 1.3 vs 2.2 for Aredia patients versus placebo patients (P=.008), and time to first SRE was significantly longer in the Aredia group compared to placebo (P=.016). Fewer Aredia patients suffered vertebral pathologic fractures (16% vs 27%, P=.005). Survival of all patients was not different between treatment groups. **/* Fractures and radiation to bone were two of several secondary endpoints. The statistical significance of these analyses may be overestimated since numerous analyses were performed. Aredia is indicated for the treatment of patients with moderate to severe Paget's disease of bone. The effectiveness of Aredia was demonstrated primarily in patients with serum alkaline phosphatase >/=3 times the upper limit of normal. Aredia therapy in patients with Paget's disease has been effective in reducing serum alkaline phosphatase and urinary hydroxyproline levels by >/=50% in at least 50% of patients, and by >/=30% in at least 80% of patients. Aredia therapy has also been effective in reducing these biochemical markers in patients with Paget's disease who failed to respond, or no longer responded to other treatments. Aredia is indicated, in conjunction with standard antineoplastic therapy, for the treatment of osteolytic bone metastases of breast cancer and osteolytic lesions of multiple myeloma. The Aredia treatment effect appeared to be smaller in the study of breast cancer patients receiving hormonal therapy than in the study of those receiving chemotherapy, however, overall evidence of clinical benefit has been demonstrated (see CLINICAL PHARMACOLOGY , Osteolytic Bone Metastases of Breast Cancer and Osteolytic Lesions of Multiple Myeloma , Clinical Trials section). DUE TO THE RISK OF CLINICALLY SIGNIFICANT DETERIORATION IN RENAL FUNCTION, WHICH MAY PROGRESS TO RENAL FAILURE, SINGLE DOSES OF AREDIA SHOULD NOT EXCEED 90 MG (see DOSAGE AND ADMINISTRATION for appropriate infusion durations). Two 7-day intravenous infusion studies were conducted in the dog wherein Aredia was given for 1, 4, or 24 hours at doses of 1-20 mg/kg for up to 7 days. In the first study, the compound was well tolerated at 3 mg/kg (1.7 × highest recommended human dose [HRHD] for a single intravenous infusion) when administered for 4 or 24 hours, but renal findings such as elevated BUN and creatinine levels and renal tubular necrosis occurred when 3 mg/kg was infused for 1 hour and at doses of >/=10 mg/kg. In the second study, slight renal tubular necrosis was observed in 1 male at 1 mg/kg when infused for 4 hours. Additional findings included elevated BUN levels in several treated animals and renal tubular dilation and/or inflammation at >/=1 mg/kg after each infusion time. Aredia was given to rats at doses of 2, 6, and 20 mg/kg and to dogs at doses of 2, 4, 6, and 20 mg/kg as a 1-hour infusion, once a week, for 3 months followed by a 1-month recovery period. In rats, nephrotoxicity was observed at >/=6 mg/kg and included increased BUN and creatinine levels and tubular degeneration and necrosis. These findings were still present at 20 mg/kg at the end of the recovery period. In dogs, moribundity/death and renal toxicity occurred at 20 mg/kg as did kidney findings of elevated BUN and creatinine levels at >/=6 mg/kg and renal tubular degeneration at >/=4 mg/kg. The kidney changes were partially reversible at 6 mg/kg. In both studies, the dose level that produced no adverse renal effects was considered to be 2 mg/kg (1.1 × HRHD for a single intravenous infusion). Aredia is excreted intact primarily via the kidney, and the risk of renal adverse reactions may be greater in patients with impaired renal function. Patients who receive Aredia should have serum creatinine assessed prior to each treatment. In patients receiving Aredia for bone metastases, who show evidence of deterioration in renal function, Aredia treatment should be withheld until renal function returns to baseline (see WARNINGS and DOSAGE AND ADMINISTRATION ). Aredia has not been tested in patients who have class Dc renal impairment (creatinine >5.0 mg/dL), and has been tested in few multiple myeloma patients with serum creatinine >/=3.0 mg/dL. (See also CLINICAL PHARMACOLOGY , Pharmacokinetics .) For the treatment of bone metastases, the use of Aredia in patients with severe renal impairment is not recommended. In other indications, clinical judgment should determine whether the potential benefit outweighs the potential risk in such patients. Osteonecrosis of the jaw (ONJ) has been reported in patients with cancer receiving treatment regimens including bisphosphonates. Many of these patients were also receiving chemotherapy and corticosteroids. The majority of reported cases have been associated with dental procedures such as tooth extraction. Many had signs of local infection including osteomyelitis. A dental examination with appropriate preventive dentistry should be considered prior to treatment with bisphosphonates in patients with concomitant risk factors (e.g., cancer, chemotherapy, corticosteroids, poor oral hygiene). While on treatment, these patients should avoid invasive dental procedures if possible. For patients who develop ONJ while on bisphosphonate therapy, dental surgery may exacerbate the condition. For patients requiring dental procedures, there are no data available to suggest whether discontinuation of bisphosphonate treatment reduces the risk of ONJ. Clinical judgment of the treating physician should guide the management plan of each patient based on individual benefit/risk assessment. Aredia was nonmutagenic in six mutagenicity assays: Ames test, Salmonella and Escherichia /liver-microsome test, nucleus-anomaly test, sister-chromatid-exchange study, point-mutation test, and micronucleus test in the rat. Many of these adverse experiences may have been related to the underlying disease state. The following table lists the adverse experiences considered to be treatment-related during comparative, controlled U.S. trials. Of the toxicities commonly associated with chemotherapy, the frequency of vomiting, anorexia, and anemia were slightly more common in the Aredia patients whereas stomatitis and alopecia occurred at a frequency similar to that in placebo patients. In the breast cancer trials, mild elevations of serum creatinine occurred in 18.5% of Aredia patients and 12.3% of placebo patients. Mineral and electrolyte disturbances, including hypocalcemia, were reported rarely and in similar percentages of Aredia-treated patients compared with those in the placebo group. The reported frequencies of hypocalcemia, hypokalemia, hypophosphatemia, and hypomagnesemia for Aredia-treated patients were 3.3%, 10.5%, 1.7%, and 4.4%, respectively, and for placebo-treated patients were 1.2%, 12%, 1.7%, and 4.5%, respectively. In previous hypercalcemia of malignancy trials, patients treated with Aredia (60 or 90 mg over 24 hours) developed electrolyte abnormalities more frequently (see ADVERSE REACTIONS , Hypercalcemia of Malignancy ). In a study of the safety and efficacy of Aredia 90 mg (2-hour infusion) versus Zometa 4 mg (15-minute infusion) in bone metastases patients with multiple myeloma or breast cancer, renal deterioration was defined as an increase in serum creatinine of 0.5 mg/dL for patients with normal baseline creatinine (<1.4 mg/dL) or an increase of 1.0 mg/dL for patients with an abnormal baseline creatinine (>/=1.4 mg/dL). The following are data on the incidence of renal deterioration in patients in this trial. See Table below. * Patients were randomized following the 15-minute infusion amendment for the Zometa arm. Rare instances of allergic manifestations have been reported, including hypotension, dyspnea, or angioedema, and, very rarely, anaphylactic shock. Aredia is contraindicated in patients with clinically significant hypersensitivity to Aredia or other bisphosphonates (see CONTRAINDICATIONS ). The recommended dose of Aredia in moderate hypercalcemia (corrected serum calcium * of approximately 12-13.5 mg/dL) is 60 to 90 mg given as a SINGLE-DOSE, intravenous infusion over 2 to 24 hours. Longer infusions (i.e., >2 hours) may reduce the risk for renal toxicity, particularly in patients with preexisting renal insufficiency. The recommended dose of Aredia in severe hypercalcemia (corrected serum calcium * >13.5 mg/dL) is 90 mg given as a SINGLE-DOSE, intravenous infusion over 2 to 24 hours. Longer infusions (i.e., >2 hours) may reduce the risk for renal toxicity, particularly in patients with preexisting renal insufficiency. Limited information is available on the use of Aredia in multiple myeloma patients with a serum creatinine >/=3.0 mg/dL. Vials - 30 mg - each contains 30 mg of sterile, lyophilized pamidronate disodium and 470 mg of mannitol, USP.